Oh, the Things Your Child Will Learn! Welcome to Our Seusstastial Kindergarten! 1 Oh, the Things Your Child Will Learn! 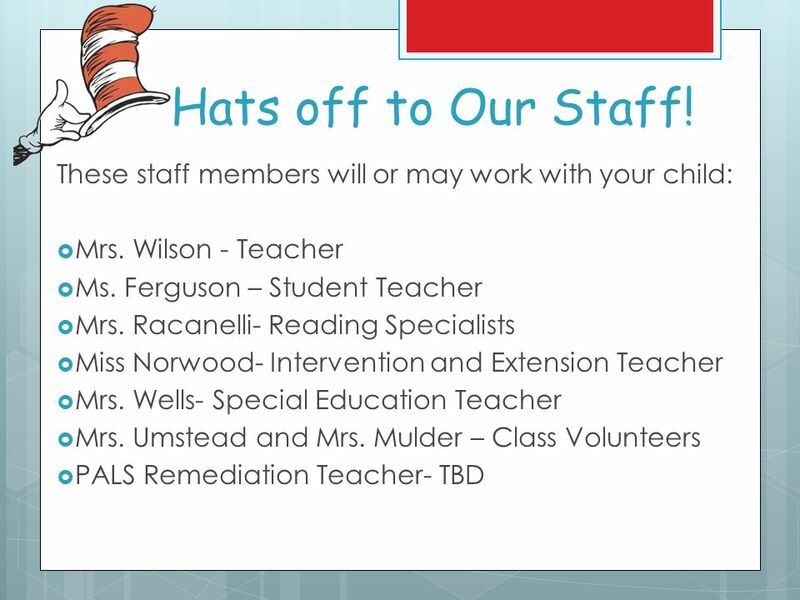 Welcome to Our Seusstastial Kindergarten! 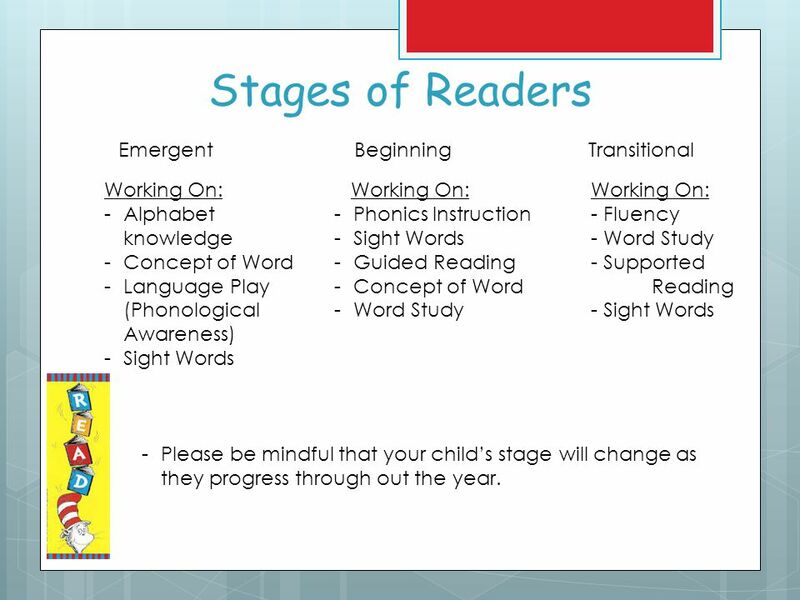 6 Stages of Readers EmergentBeginningTransitional Working On: -Alphabet knowledge -Concept of Word -Language Play (Phonological Awareness) -Sight Words Working On: -Phonics Instruction -Sight Words -Guided Reading -Concept of Word -Word Study Working On: - Fluency - Word Study - Supported Reading - Sight Words -Please be mindful that your child’s stage will change as they progress through out the year. 7 Literacy Assessments  These assessments determine your child’s reading level and stage. 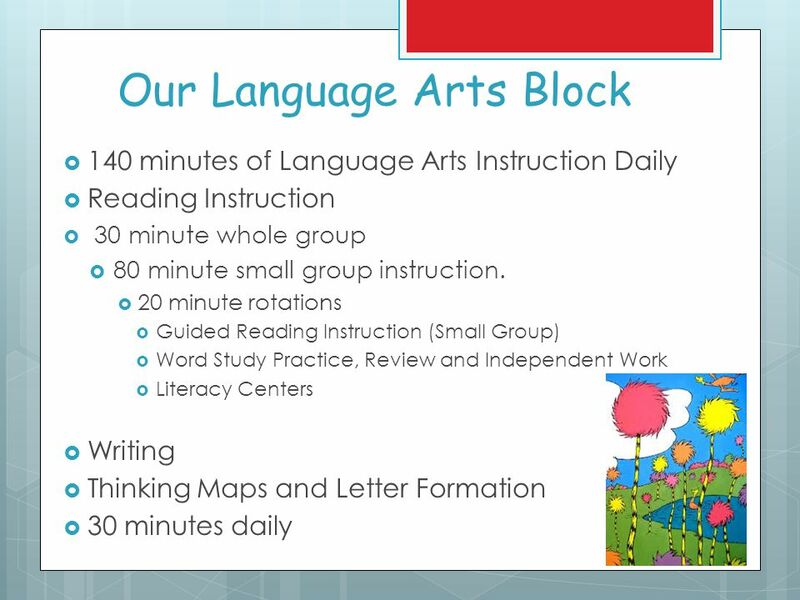 They are used to group children for small group reading instruction to best meet their individual learning needs. 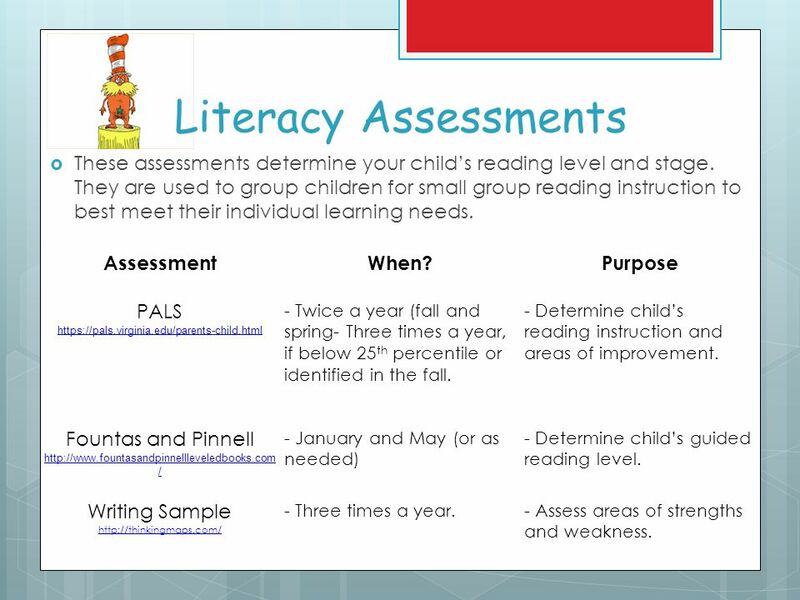 AssessmentWhen?Purpose PALS https://pals.virginia.edu/parents-child.html - Twice a year (fall and spring- Three times a year, if below 25 th percentile or identified in the fall. 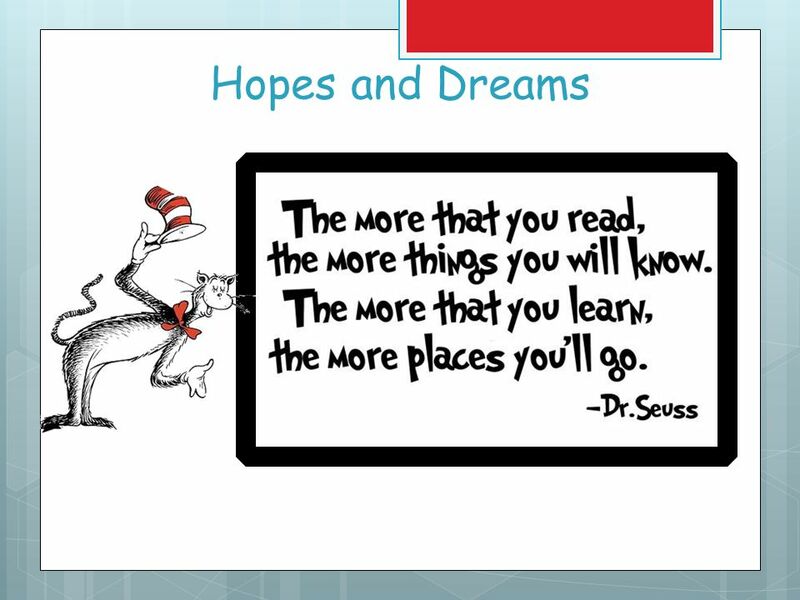 - Determine child’s reading instruction and areas of improvement. 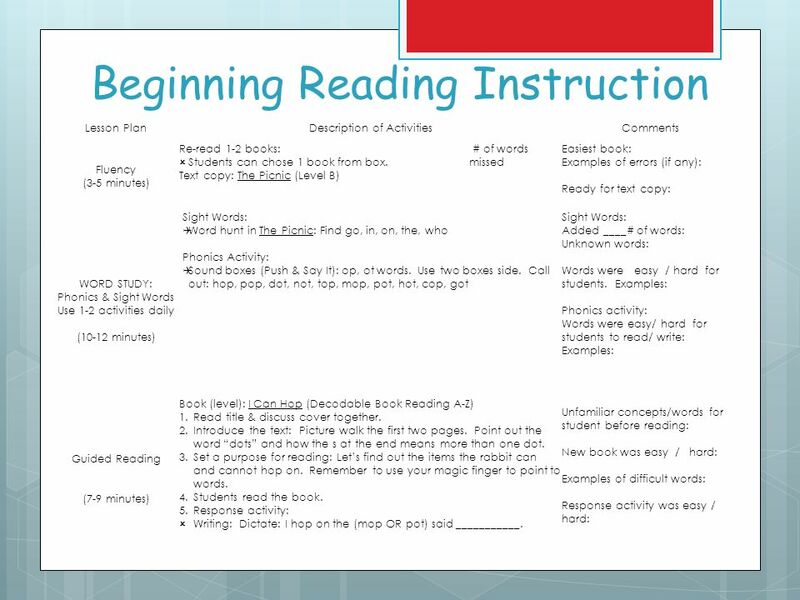 Fountas and Pinnell http://www.fountasandpinnellleveledbooks.com / - January and May (or as needed) - Determine child’s guided reading level. 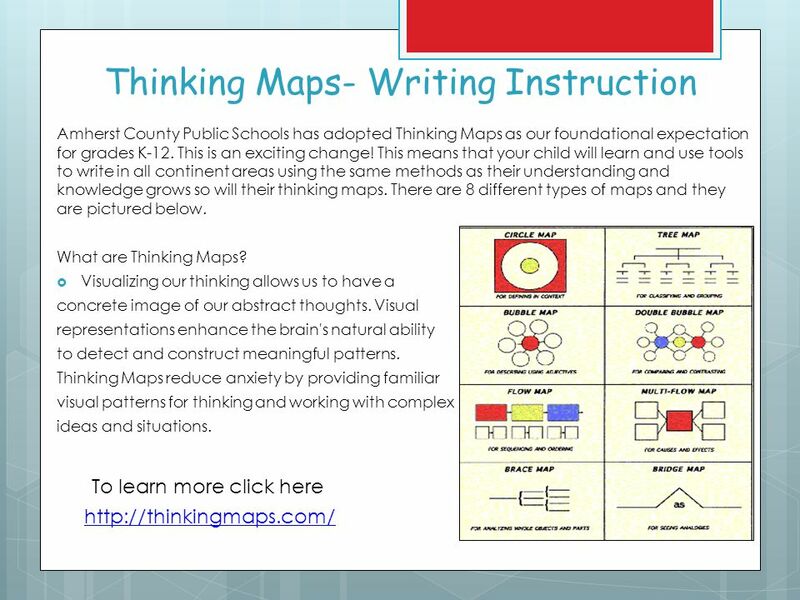 Writing Sample http://thinkingmaps.com/ - Three times a year.- Assess areas of strengths and weakness. 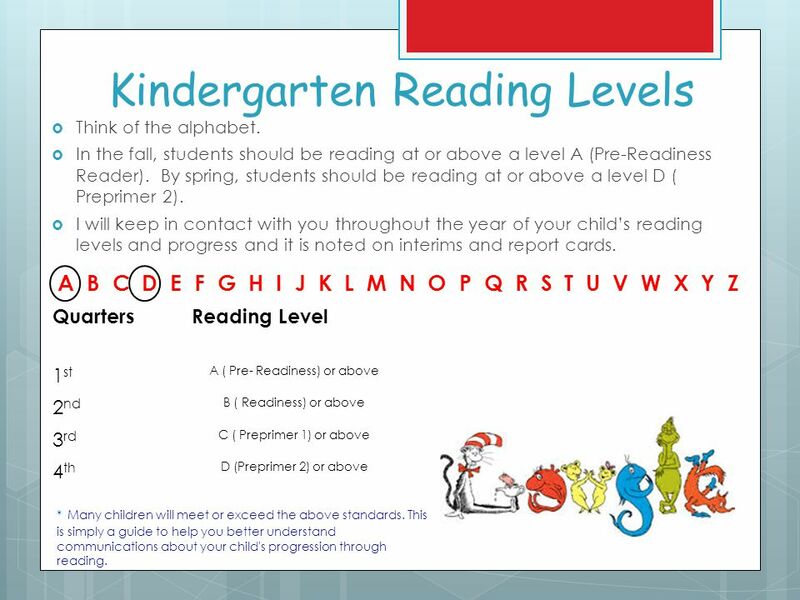 8 Kindergarten Reading Levels  Think of the alphabet.  In the fall, students should be reading at or above a level A (Pre-Readiness Reader). By spring, students should be reading at or above a level D ( Preprimer 2).  I will keep in contact with you throughout the year of your child’s reading levels and progress and it is noted on interims and report cards. A B C D E F G H I J K L M N O P Q R S T U V W X Y Z QuartersReading Level 1 st A ( Pre- Readiness) or above 2 nd B ( Readiness) or above 3 rd C ( Preprimer 1) or above 4 th D (Preprimer 2) or above * Many children will meet or exceed the above standards. This is simply a guide to help you better understand communications about your child's progression through reading. 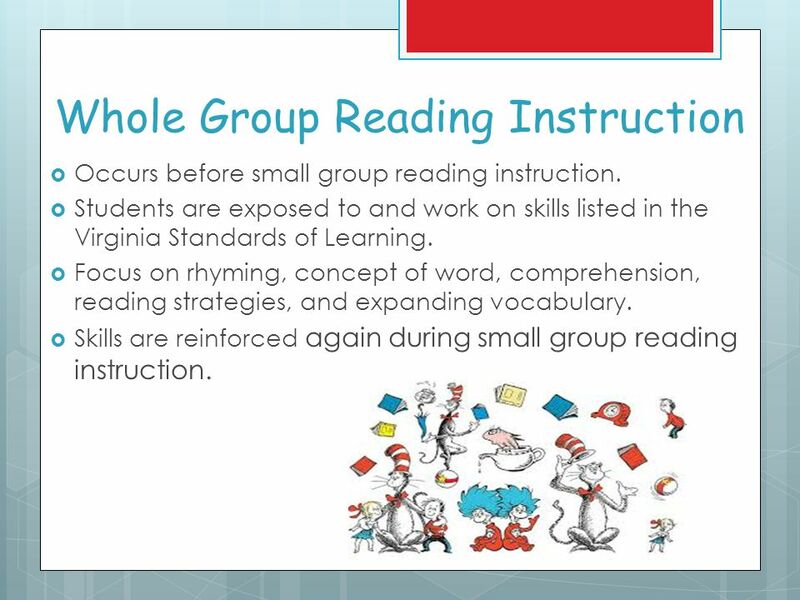 9 Whole Group Reading Instruction  Occurs before small group reading instruction.  Students are exposed to and work on skills listed in the Virginia Standards of Learning.  Focus on rhyming, concept of word, comprehension, reading strategies, and expanding vocabulary.  Skills are reinforced again during small group reading instruction. 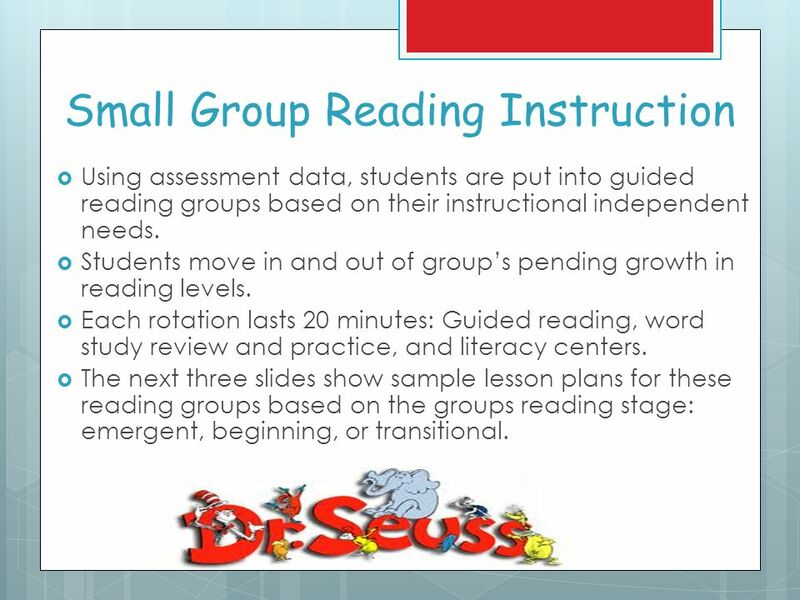 10 Small Group Reading Instruction  Using assessment data, students are put into guided reading groups based on their instructional independent needs.  Students move in and out of group’s pending growth in reading levels. 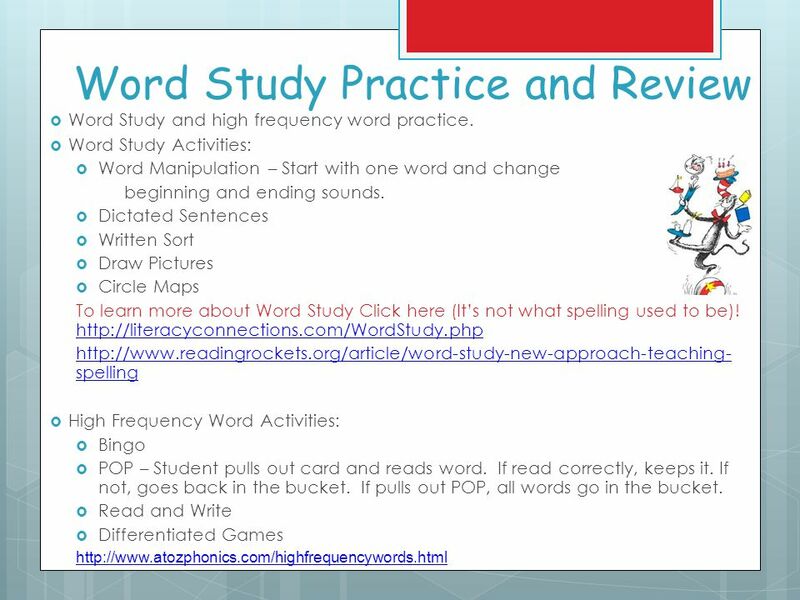  Each rotation lasts 20 minutes: Guided reading, word study review and practice, and literacy centers. 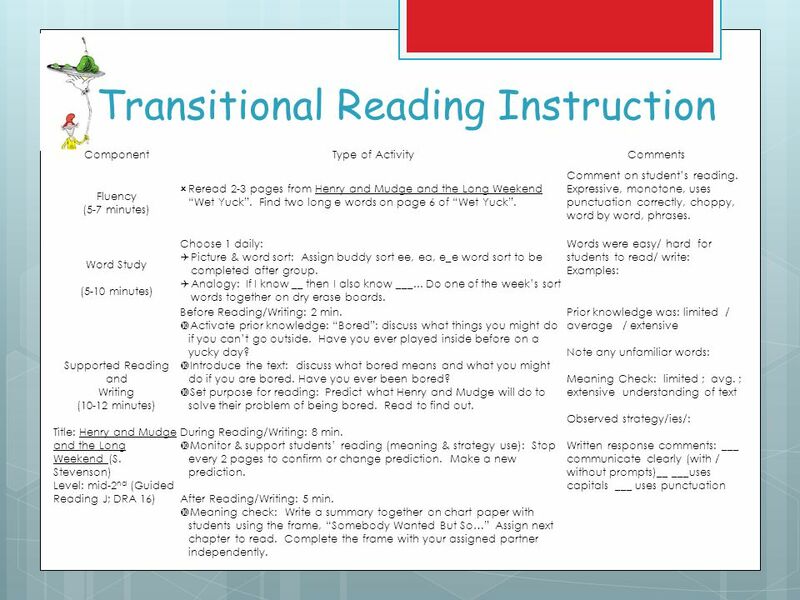  The next three slides show sample lesson plans for these reading groups based on the groups reading stage: emergent, beginning, or transitional. 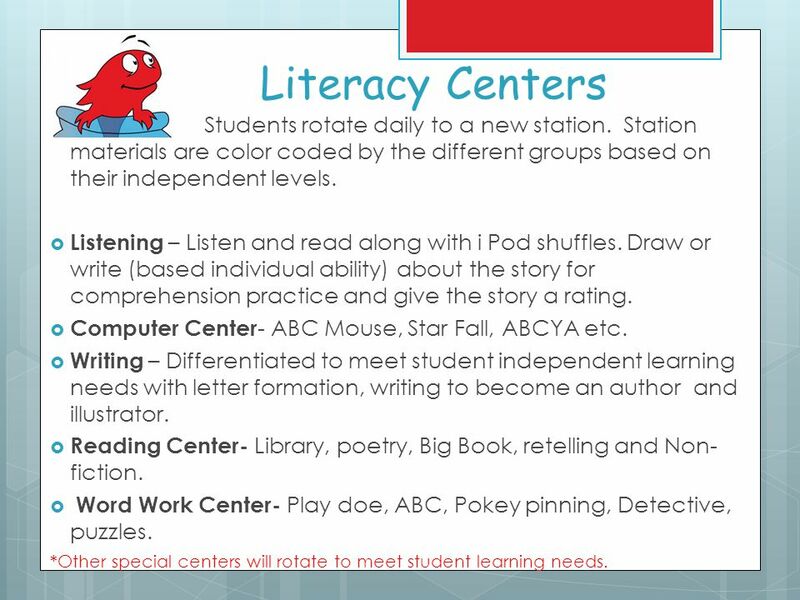 15 Literacy Centers Students rotate daily to a new station. 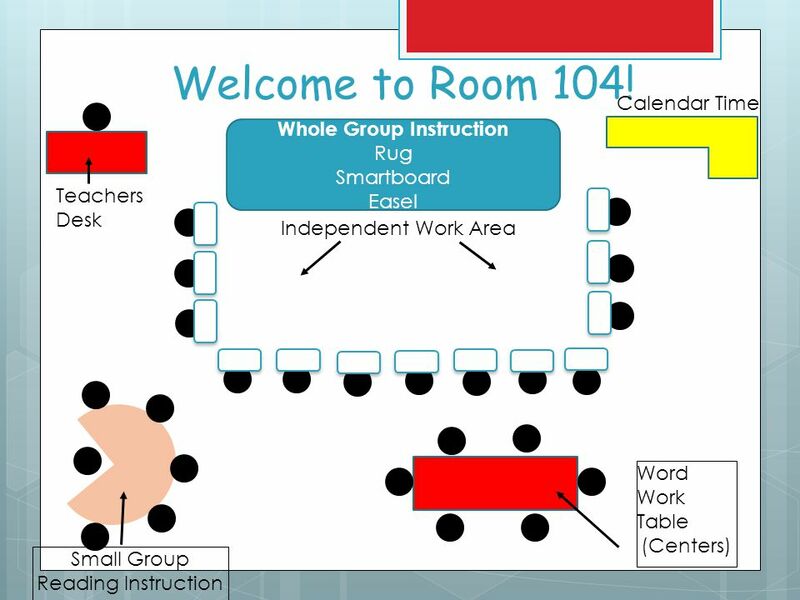 Station materials are color coded by the different groups based on their independent levels.  Listening – Listen and read along with i Pod shuffles. Draw or write (based individual ability) about the story for comprehension practice and give the story a rating.  Computer Center - ABC Mouse, Star Fall, ABCYA etc.  Writing – Differentiated to meet student independent learning needs with letter formation, writing to become an author and illustrator.  Reading Center- Library, poetry, Big Book, retelling and Non- fiction.  Word Work Center- Play doe, ABC, Pokey pinning, Detective, puzzles. 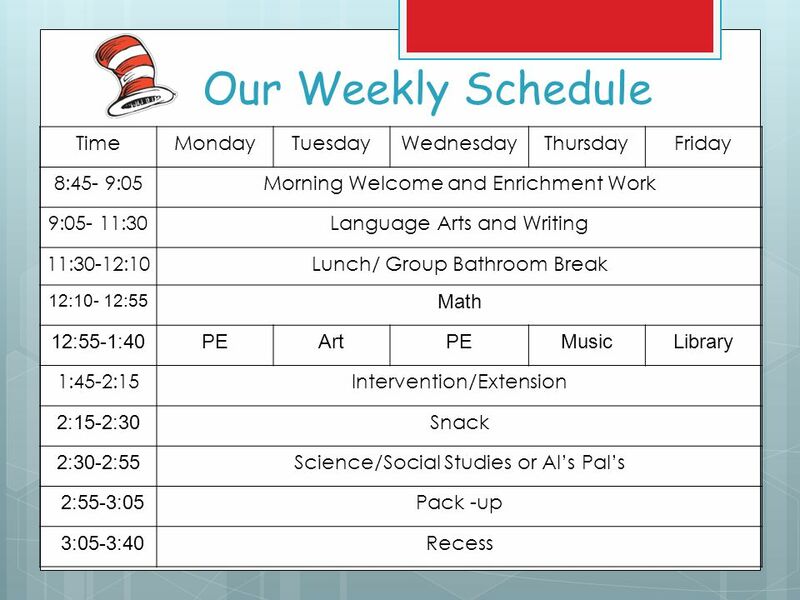 *Other special centers will rotate to meet student learning needs. 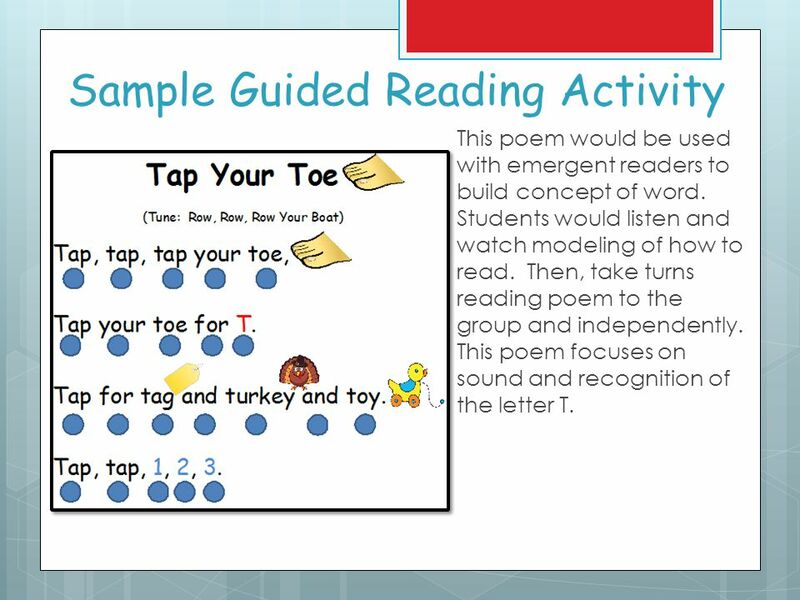 16 Sample Guided Reading Activity This poem would be used with emergent readers to build concept of word. 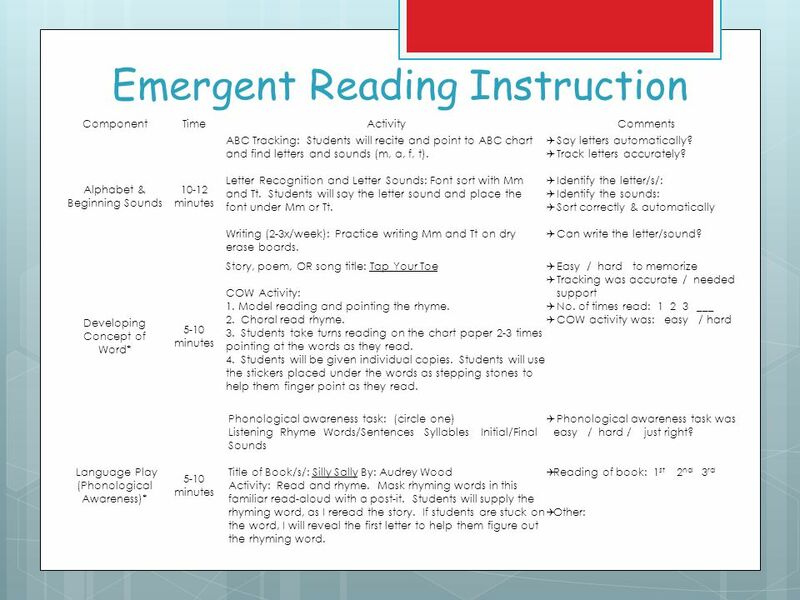 Students would listen and watch modeling of how to read. Then, take turns reading poem to the group and independently. 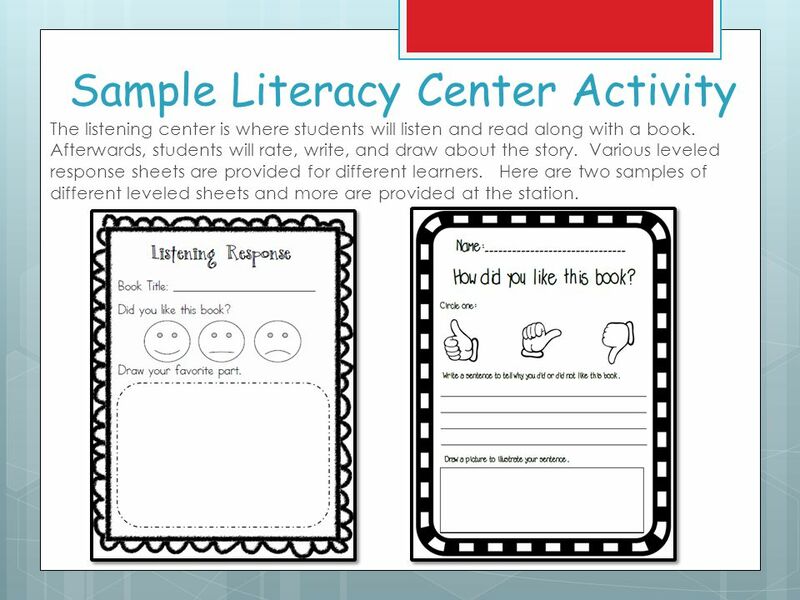 This poem focuses on sound and recognition of the letter T.
18 Sample Literacy Center Activity The listening center is where students will listen and read along with a book. Afterwards, students will rate, write, and draw about the story. Various leveled response sheets are provided for different learners. Here are two samples of different leveled sheets and more are provided at the station. 20 What can you do to help?  Read to your child every night.  Have your child read the book that is sent home. 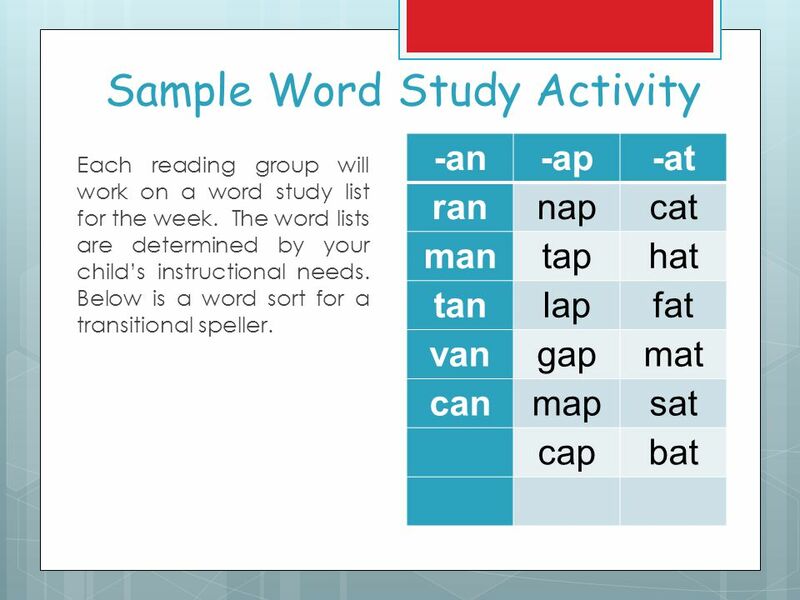  Practice word study through reading and spelling.  Ask your child questions about their school day allowing them to recall their day and details.  Encourage your child to write and illustrate their own stories. “Research demonstrates that when parents and teachers partner together, at-risk student achievement increases” (Darling, 2005). 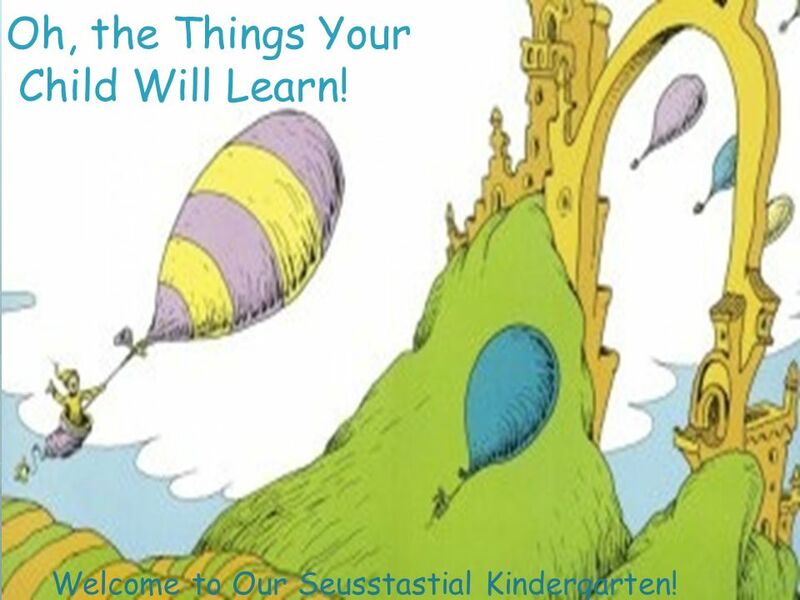 Download ppt "Oh, the Things Your Child Will Learn! Welcome to Our Seusstastial Kindergarten!" 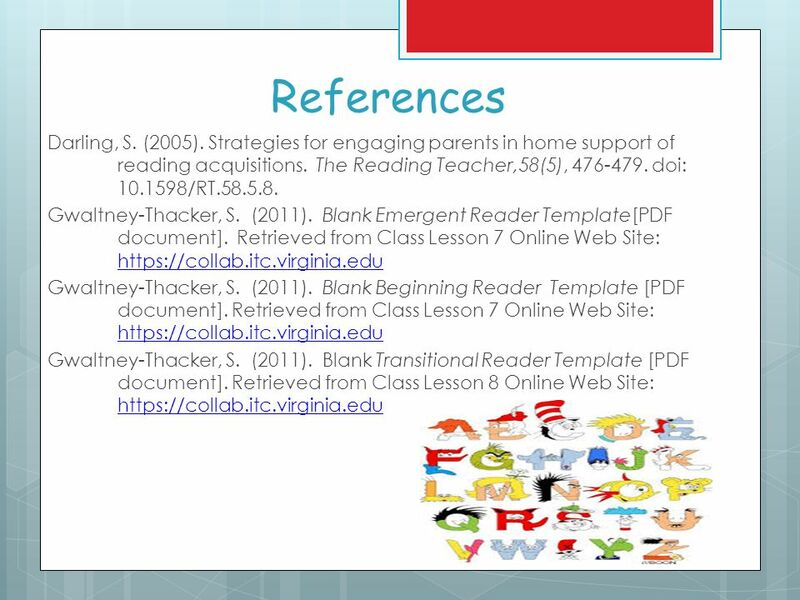 Materials and Programs for Literacy Instruction Chapter 6. 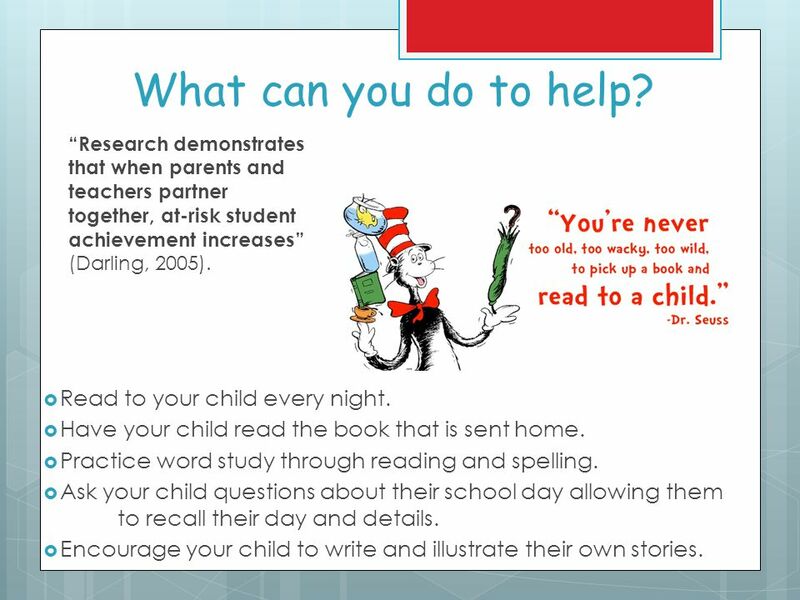 Williamsville’s Title 1 Program… Teachers and Parents Working Together for Children. Nurturing Growing Writers and Teachers of Writers Complied by: The Literacy Link. What is phonological awareness? Being aware of the sounds that make up words. 1. Guided Reading Objectives General Understanding of Guided Reading Essential Elements of G.R. Dyer-Kelly’s G.R. Book Club Structure Use of Icons to build. S MALL G ROUP READING INSTRUCTION A Differentiated Approach to Reading Instruction (The Tyner Model & supporting materials) Facilitator: Lynn White SAGE. Fountas & Pinnell Leveled Literacy Intervention. A Day in the life of a Kindergartener Arrival Children arrive, unpack, make lunch choices and work on morning work. RTI This is a designated time of.